This is a traditional picnic table, made modern thanks to its unusual blue metal frame and light wood top and seats. Your summer just got more sophisticated. Picnic tables are a practical choice – you get a table and chairs all in one, and the slatted polywood top drains water away quickly. 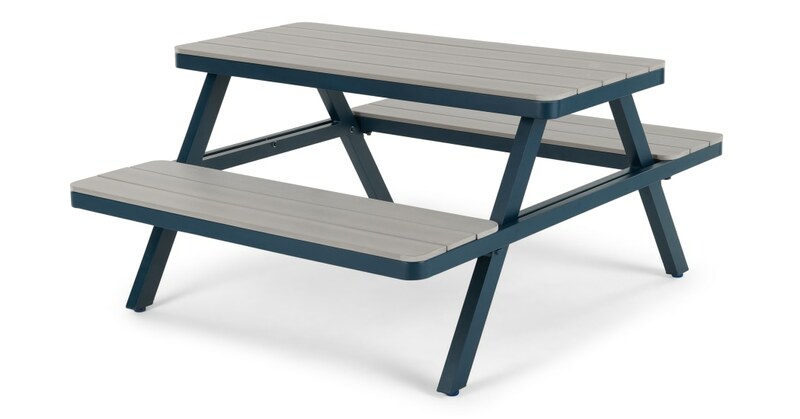 The light and dark contrasting colour palette, and metal frame, give this picnic table an industrial look. But it's softened by the rounded corners – literally. Easily seats 4-6.